Rosie turned 6 this year, and as usual she has a birthday Season rather than one party. On her birthday proper, it was a Thursday and she had dance class, so she just opened presents from us and Grandparents, had dinner with me and her dad, and Uncle Chris skyped in to join in singing Happy Birthday before she blew out six candles stuck in a slice of cheesecake. That Friday her aunt Sarah flew in for a visit, so Saturday we had a sort of "family" party with some close friends, and we had a small ice cream cake with strawberries, and another round of singing and presents. And having Sarah visit was a gift in and of itself. TODAY we have the "friends from school" chaos, I mean, party, and it's going to be here at the house as well. It would have been easier to go to Chuck e Cheese or a similar place like most of her classmates have done, but once we got a house with a pool she had her heart set on a pool party, so we have a lifeguard friend coming over as well as 8-10 school friends, and we got a Slip and Slide type slide which we still haven't set up yet, in case the pool gets boring. There's still a big pile of boxes in the living room but I worked hard the last few days getting boxes *out* of the playroom downstairs and setting it up with toys, and Brian installed the cat door to the utility room, so we can lock them out of that, so I'm hoping the kids will pretty much stay out of the living room because it's boring compared to the pool, the sun room, and the play room. I just really hope no one sprains or breaks an ankle or anything, because the yard is full of trip hazards we haven't resolved yet. And the party starts in 3 hours and I'm still cleaning. I'm trying not to freak out, though. Or as I imagine Chuck Wendig might write, "I'm not freaking out! YOU'RE freaking out. Just shut UP over there with your stupid 'freak-out' face." Cupcakes are made and will be frosted once Brian and Rosie get home. I'm going to get back to sweeping and vacuuming, and then we will put up decorations. The Rosie kiddo is now sans tonsils and adenoids and plus tubes in ears. Her surgery was shortly before 9 this morning and we headed home from the hospital by 4. Her cuddle of choice was my old stuffed Stitch, because, as she put it, "He keeps away the bad dreams even without the dream catcher." She knew she would go to sleep for the surgery. When she woke up enough to realize she was in pain, Stitch was there but she still panicked a little and they rushed to bring me in. I comforted her and held her hand while the nurse gave her some painkiller, then I stroked her forehead and sang and hummed until she fell back asleep. I was slightly surprised what my brain decided to use to sing her down just then, and I thought I would record that and the other songs I sang to her as the day went on and from time to time she got tired and went back to sleep. First I started with the old round, "Hey, ho, nobody home." I was surprised with myself until I got to the line, "Yet I will be happy, very happy," and thought maybe it wasn't such a strange choice after all. Later, when we were back at home, I surprised myself again by singing the Beatles' "Here Comes The Sun". ("And I say... It's all right.") Again, maybe not so strange. And just a little while ago, after she woke crying and I have her the dose of ibuprofen she was due? "Swing low, sweet chariot." All good songs. And the other parts of the day went fairly well too, all things considered. Now it's time for me to put myself to sleep. Sing me a song, won'tcha? Yesterday I took a day off. I mean, I got up early with Rosie, I read her books, I made us breakfast, later I did dishes, prepared lunch for all three of us, took Rosie with me to the post office, and grocery shopping, and cooked dinner, then helped get Rosie ready for bed. But Brian took care of Rosie for most of the day, and let me rest, and read (Nicola Griffith's Ammonite --good book! ), so it felt like a day off. After breakfast I was tired, and cold, and fell asleep in a nap on the couch after breakfast while Rosie played. Brian came down and woke me and sent me upstairs to bed, and later I took a slow shower with self-care afterward like cutting fingernails and toenails, and putting cream on my overly dry feet. When I went downstairs Brian and Rosie had begun to make boxes into an ice palace for her Anna and Elsa dolls, and for a little while before dinner I sat and read and enjoyed the last glass of eggnog (+ rum & nutmeg) while they decorated the palace before I got started on dinner. Brian couldn't drink the eggnog because he got his gall bladder taken out on Tuesday, and is on a low fat diet for a week or two. We did eventually get the driveway cleared, right around when Brian texted to say he was awake, so we went and got him some flowers and took those, some family photos, and an overnight bag (and his phone charger!) to him at the hospital and had a nice visit. Brian was pretty out of it still from the anesthesia, but he was glad to see us, and I and the nurses helped make him a little more comfortable. Then I took Rosie to her swim class, and home for dinner. She didn't "feel like having daddy stay at the hospital overnight," but she wasn't fretting too badly. Brian's gall bladder had turned out to be infected and have "hundreds of stones" so although they were able to do the surgery laproscopically he stayed in the hospital until Wednesday evening so they could give him a dose of antibiotics. Rosie and I visited him briefly right after her morning school, then were out all afternoon at an appointment, and then we saw Brian at home (a colleague of his checked him out while we were away), and I took Rosie back out for her tap class at 4:30, and she stayed in childcare while I had an aerobics class before dinner. We put the child to bed together and then I helped Brian take a shower -- he didn't need much help, actually. I changed a dressing and helped him dry off afterward. After that, Rosie wanted to go swimming, which is what we'd talked about the night before, so we did. There was another girl there Rosie's age, whose mom was trying to coax her into the water with all kinds of toys. Rosie happily dove after the toys, and kept trying to return them. She loves the water, which I do too, so I'm glad. Rosie's swim instructor was there giving a private lesson, and Rosie was happy to see her. Later, as we got out of the pool I heard the instructor comment to the lifeguard, regarding Rosie, "That personality! That's what you live for!" We went home to dinner cooked by a somewhat recovered Brian, and then I crashed, all of the exercise, etc. of the previous three days finally catching up to me. Friday I helped drive Rosie's pre-k class to the college campus for a walk along the creek there, and she had a playdate at a classmate's house for the afternoon, so that gave me a break too. Still, by Friday night I was Tired. Saturday, I really needed a break, so I'm glad Brian was supportive. I'm also glad he was feeling well enough to do that. 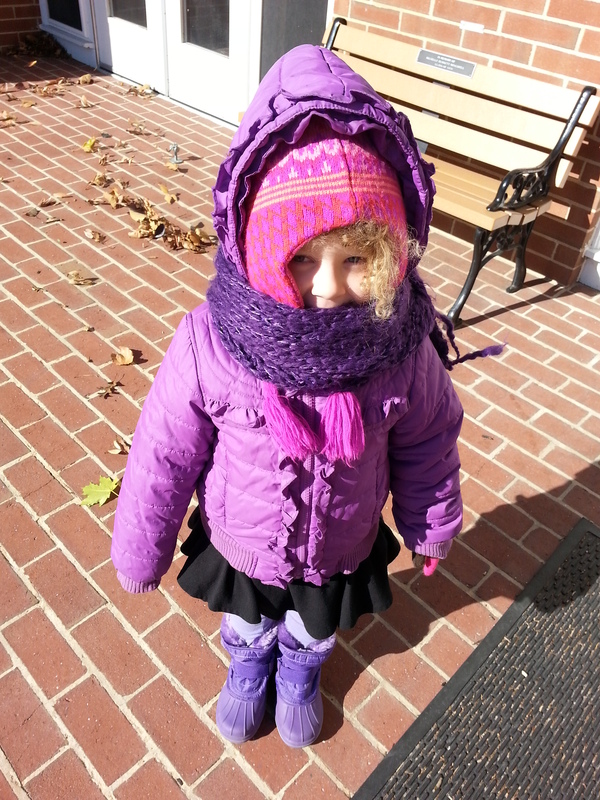 Unlike anyone else in her pre-school class, Rosie walks to school. We live only a few blocks from her school, plus I like the opportunity to connect her to the outdoors and teach her about how to dress for every kind of weather. She has turned out to be very observant. The other day we stopped to pick up a snail and watch it relax and wander around on a piece of cardboard. Another morning we picked up a leaf that had frost on it and carried it inside the school to see what would happen. This week it got very cold, and very windy. I dressed Rosie up appropriately, and we walked anyway. Before we headed home she stopped to watch whirling dervishes play with the leaves near the entrance to her school. A moment later, she commented that the wind at her back made her feel like a bird. Along the way home, she found a heart-shaped leaf and gave it to me. 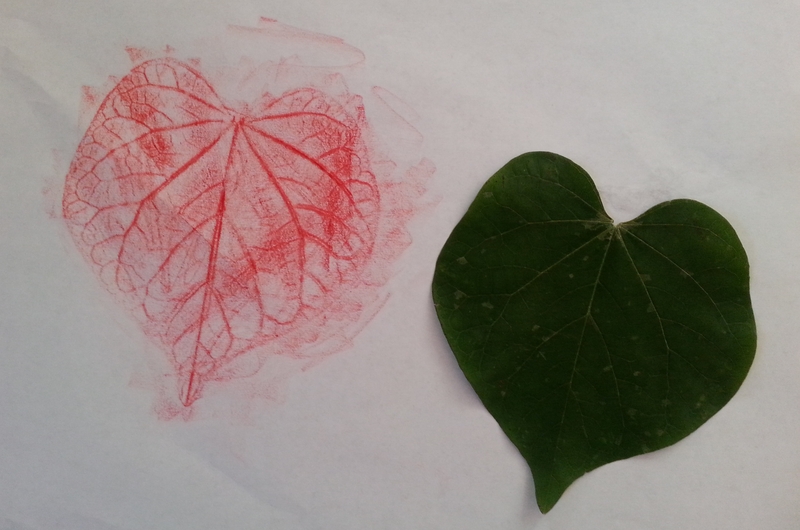 I suggested that we could do a rubbing of the leaf when we got home. She declared she wanted to do it with a red crayon. Worried that it might blow away, we put it in her backpack. She admonished me not to let us forget it. The other day, the first frost day, there was also sunshine. Under one tree, it was very pretty, with the branches hanging down all around us, large oval leaves heavy and gold. I had not brought my phone with me and announced we would just have to take pictures with our minds. "You can't take pictures with your mind!" she told me. "Sure you can," I explained. "You just look and try to fix it in your mind so you will remember." She was willing to try. Further along there was a tree that had been bright red earlier in the Fall, one of the first trees to turn. Now it was almost bare. She complained that the tree looked sad and ugly with no leaves. 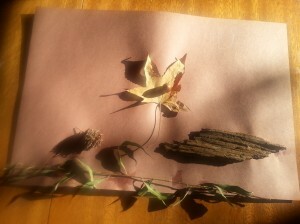 I agreed that sometimes Fall was like that, and trees did look sad and bare with no leaves. I added though that once winter comes, I think trees can look very pretty with snow on their branches. She agreed, but stayed there a moment, looking up at the tree. "Goodbye leaves," she said. "Hope we see you again soon." Rosie had no school on Friday, due to parent teacher conferences, so another parent and I swapped time watching our kids so we could attend our respective conferences. He and his daughter also joined Rosie and I for lunch. Then that evening Rosie and Brian and I went out to dinner With Justina Ireland and family, the first chance for the two families to meet each other since Justina and I met at the Baltimore Book Festival and I learned that they had also recently moved to York. Everyone got along well, though Rosie got a little melty near the end (having already had a long afternoon of sharing with a friend) and was really jealous of how well Justina's 6-year-old could draw. The food was really good too -- an authentic Mexican place on the East side called Guadalajara. Saturday was Brian's birthday, but I wasn't there for the first half of the day because Justina and I headed out early to drive to Arlington for the SFWA business meeting at WFC. Justina is a YA spec fic author who is thinking about joining, while I had put an item on the agenda that I needed to be there to speak to. We hung around after the meeting chatting with people (nice to see Steven Silver and Stephen Leigh), had an early lunch with Steven Gould, whose family Brian and R and I had gotten to know during our time in Albuquerque (almost all the male friends I ran into were named Steven.. what's up with that? Thanks, Howard, for being the exception), then we headed back to York (about a 2-hour drive, and I really appreciated that Justina drove the whole way - my early waking time was catching up to me). Then I scrambled to make the cake for Brian's birthday with Rosie, after which I headed out to see Box Trolls with Brian - my arranging for a babysitter having been my most significant present for him. She was such an awesome sitter I left her responsible for taking the cake out of the oven. It was a delightful movie and nice to just sit and relax together for a bit, especially since he's just getting over a cold and I'm fighting it myself. Back to the house for dinner, presents, and cake, and I enjoyed watching Brian and Rosie play a little rocket-race game on the birthday card we'd found for him. During her parent teacher conference, Brian and I both learned more about Rosie and how she is at school, and shared with her teacher some of our concerns and questions about how she is developing in general. We learned she is the youngest in her class -- a young 4-year-old in a class where 5 out of the 12 students have already turned 5. Accordingly, she sometimes has trouble getting other kids to play with her, since she hasn't learned yet how to join in with someone else's game or idea rather than trying to get people to do what she wants. And she isn't always good at sharing. Cognitively, however, she has already accomplished most of what they look for by the end of the year. She can recognize most of the alphabet, understands what numbers mean and can count to 20, and can draw neat geometrical shapes, for instance. She loves to draw right now, and also to dance. Her teacher described her as dramatic, energetic, and enthusiastic. She said she did a really good job talking about her trip to the Indian Echo caverns the other day at Show and Tell. Mrs. Snyder gives each kid a turn on their own day to do show and tell all by themselves, rather than having a big shared show and tell once a week. It seems to work well. Rosie really looks forward to her next turn at Show and tell. Last time she shared some feathers that she found by the lake when we went to a park with her grandmother Mary while we were in the Seattle area. Hopefully as we get to know more people in the area, she'll have more playtime and practice sharing. Brian and I will try to help her develop her social skills some ways her teacher recommended. 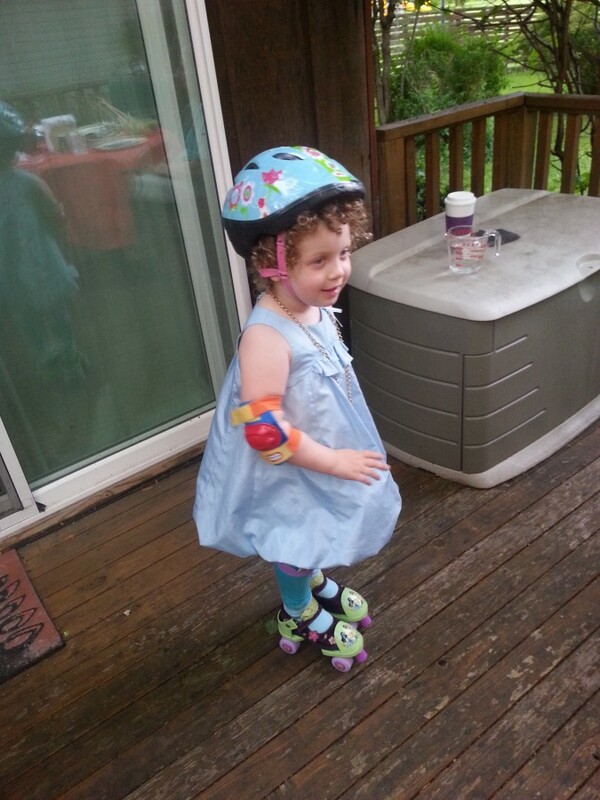 Last night after dinner Rosie wanted to rollerskate "dressed like Elsa" so she changed into a blue dress and her skating gear and rollerskated on the deck, where she did a bit of her dance recital routine _on skates_ for grandma and grandpa. We were impressed. 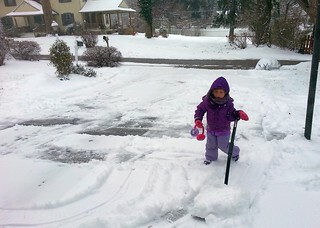 Then she took a turn on the driveway and sidewalk with me and skated in to her bath, as she put it. 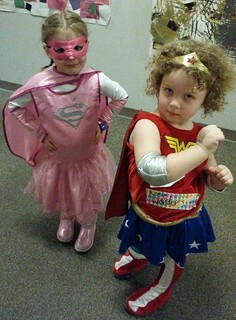 This morning she skated to school--from the car to the classroom-- with the help of her friend Lila, as it turned out. She isn't yet to the stage of pushing off and gliding on alternating feet, but she's gone from only keeping her ballance on a rug to being able to skate on any surface, and sometimes balance on one leg briefly, as she did last night with her dance routine. Over the next week, Rosie frequently asked for Miss Hassiter to help her dress, put her to bed, read her a book, play with her, or give her a bath, instead of mom. 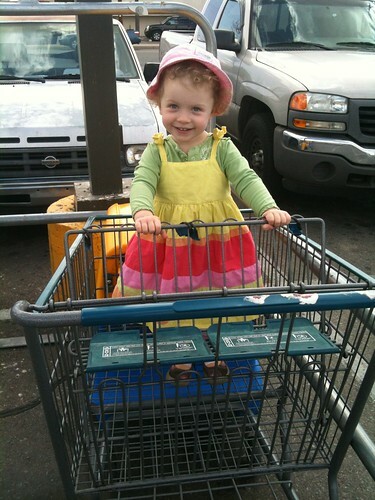 Anytime I accedently slipped and called her "sweetie" or something else like that, she would respond, "No, be Miss Hassiter!" so in this way she defined her expectations. At the same time, she was very caught up in her "Frozen" fandom, and would ask me to be either Anna or Elsa (or, rarely, another character), sometimes to take a part in a song. As that faded in frequency, Rosie then asked me to either play Doc (with or without the Doc McStuffins doll in hand) or Doc's mom, when Rosie was being Doc. I've seen a lot of the show and can sometimes do a decent version of either character's voice, but in fact this is harder than being Miss Hassiter, whom I can just make up as I go. Then Rosie watched some of Finding Nemo at a friend's house, and had a flurry of asking me to be Nemo. Nemo is active, enthusiastic, curious, and doesn't know much about the world of people, and she seemed to really enjoy being asked about things around us. She also sometimes asked to see his little "lucky" fin. Brian got recruited to be Dori, and he really does a good job of it, so most of the time Rosie asked me to be Dori, I suggested she have dad do it, but I played that role, as well as Nemo's dad, a few times too. This tendency to ask us to 'be' a character, has slowed down a bit for the moment, but I wanted to record it a bit before it's gone altogether. Rosie has also once asked me to be another living person, but I refused, indicating that I didn't want to misrepresent them. As I've commented to Brian, I think, in addition to being imaginative, having us be characters also gets us to pay more attention to her, instead of being distracted by other things around us and cleaning or looking at our phones or other things that would be out of character when we're playing a part. I've tried to get better at being attentive in play whether or not I'm "being" someone, as well. Anyway, it's been very interesting, and sometimes amusing, but sometimes we've also gotten tired of it and... almost jealous, really, wanting her to want us to be ourselves and not someone else all the time. So that could be why she's not doing it so much now. We don't have a TV. We have screens, but they are all computers, and we don't subscribe to any television services. A friend of mine recently asked me, "Can you tell me a little more about why you guys don't have a TV at home? [...] Did you grow up without a TV?" I didn't grow up without a TV, but my parents were very restrictive about TV watching. We also only had a little black and white TV until I was about ten. But they would watch the news, and Sunday Morning, and we were allowed to watch cartoons on Saturday mornings. When I was in Junior high I remember I would watch more TV but I found it kind of... understimulating and usually folded clothes or did jigsaw puzzles at the same time. Sunday evenings I would frequently do jigsaw puzzles and watch Star Search, 21 jump street, and Star Trek. Most weekdays I didn't watch TV - I did my paper route, read, danced, did sports, chores, or did things with friends-, and we almost never watched it during meals. I also remember watching Cosmos, Nature, Sesame Street, 3-2-1-contact, many Jacques Cruseau documentaries about diving in the sea, and other educational stuff. The Olympics and other sports. And televised live theater, and miniseries - as a family, we watched North and South, and some British miniseries I only remember now because it made it impossible for me to maintain a southern accent when I was in the play Tom Sawyer - I kept slewing into a British accent. But most of my young childhood, like I say, there was only this little (8 or 10" screen) portable television, and then later the television was in the basement rec room. We would watch movies there, too. On very rare occasions we might have dinner in front of the TV. But it wasn't an always-on sort of thing I see in some households these days. And we didn't ever have any video game consoles. After college I moved in with my boyfriend, and he had game players, and at one point we moved into an apartment that had cable. Suddenly we watched tons of TV - reruns of the Simpsons almost every day, lots of movies. And we played video games. Later I really regretted all the wasted time (not to mention weight gained by lack of active lifestyle). When I was working on my Master's thesis, I still had a TV, and found myself retreating to it when I was struggling, and losing whole afternoons on things I didn't even want to watch. Later, when the cable co. became our internet provider, and they kept calling to see if we didn't want cable tv too, our response was "Can you give us back all the time we'd spend watching it?" They stopped calling. At the same time, we had a big screen movie setup in the basement, but when I was on my own I found I almost never used that, either. I'm much more interested in reading or doing something active, interactive or productive, most of the time. --Which can include screen time, don't get me wrong; long hours on the computer. And for a while working on my thesis I lost time to video games, too. Now I don't play them any more. I do let Rosie play video games, though - some on my phone, some on pbskids and sesamestreet.org and whatnot. And when she's older we'll likely get whatever gaming equipment is really popular. In high school, my friends and I hung out at the house that had gaming stuff, room to hang out, an open attitude toward feeding lots of people, and relaxed parents. When Rosie's older, I want that to be our house at least some of the time. Right now, I want her to develop the skills, but not the addiction. So she has her own computer with a one-button mouse, an old laptop in the living rm we play dvds on, and is learning to use my two-button mouse, she has a kindle fire, and sometimes hits the buttons on the phone to call relatives or hang up. But we go days with no screen time for her, sometimes. Some days we also sit at our computers, both of us, for about an hour. I find I'm more comfortable with that right now than limiting it to half an hour a day, or whatever. I'd rather let it be a thing you sometimes do if you want to than an everyday habit. Rosie's favorite TV shows right now are Doc McStuffins (Amazon/kindle) and Dinosaur Train (pbskids), and that's perfectly fine with me. As for me, I watch Castle on Hulu.com, and we have DVDs of shows and films. Used to have netflix. Might again sometime. I'm sometimes sad I can't get shows other people are watching on TV at the same time they're watching it. But that's changing - more is coming to the internet, where there's good stuff to watch whenever you want to watch something. I think video is a valuable teaching and storytelling tool, but I also think it's important for parents to read to kids and to tell them our own stories--and encourage them to tell their own stories, both verbally and with art and movement. And just as important for them to get time to play outside and with their hands and imagination, and with other kids. When your child cries in fright during the night, don't assume it's a scary dream. There's another kind of event that can wake preschoolers called night terrors. Night terrors run in families, and children who are overtired or agitated are more susceptible. Most outgrow the episodes in the early elementary years. Rosie seems to be having these lately. Frequently just as I'm getting ready to go to bed she'll start thrashing around. Sometimes she kicks the wall. Sitting with her and shushing her or rubbing her back sometimes seems to help. Sometimes I'll just go sit or (if I'm really tired) lie down with her to make sure she doesn't fall off her bed. It's hard not to be disturbed when she seems so distressed in her sleep, but yeah, even if I pick her up and move her away from the edge of the bed, or if she suddenly sits up, she doesn't wake up most of the time. Rosie has started to get bored with many of her old bedtime songs, like "Somewhere over the rainbow" and "The rainbow connection," and has declared she doesn't like some others, like Wendy's lullaby from Peter Pan. So I have started to sing her story songs from "Really Rosie" and "Free To Be You and Me," and also Land of the Silver Birch, a Canadian native canoeing song I learned when I was young (various lyrics are out there - these were the words I learned but I learned the rhythm part as "boom-didi-ah-dah, boom-didi-ah-dah, boom-didi-ah-dah, boom"). Let me help you go to sleep. This clip is pretty close to how I sing it, tunewise. During Rosie's bath tonight I spelled R-O-S-I-E out on the side of the tub using rubber alphabet letters, announcing each letter as I found and added it. "What did I spell?" I asked. Rosie had a tiny splinter in her foot today, so I had to hold her foot still while Brian took it out with tweezers. Thankfully I had recently told her the Aesop's fable about the Lion with a thorn in his paw, which I reminded her as she lay there crying and I gave her a hug. "You were like that Lion," I said. "You had in a thorn in your paw, and you couldn't get it out by yourself, so daddy helped you and took it out." She repeated that idea back to me, then went over to Brian and sweetly gave him a hug. She said, "Thank you, Daddy cat, for taking the thorn out of my paw." "You're welcome, Baby cat," said Brian. "I need to do it!" We are in that phase. Getting dressed (including choosing clothes) and undressed. Emptying her own potty into the toilet (including rinsing the potty insert and wiping it out, and flushing. Brian flushed the toilet tonight while Rosie washed her hands and we were treated to a repetition of "Need to flush my poop!" for the next 5 minutes, with occasional melodramatic collapsing on the floor) Then, she also "needs to" put the potty back together and close the lid. Washing and drying her hands. Climbing into her chair for meals. Getting in and out of the car: opening the car door (She can do it if she grabs the handle tightly and then we take her other hand and pull on her), climbing into the car seat, helping pull the door closed, putting on her seat belt and clipping it, then on arrival helping to unclip her seat belt, opening her door (note: this requires I close her door after we unfasten her seat belt ("together"), so she can open the door again), climbing out of the car, closing the car door from the outside. Opening our screen door from the outside (I have to pick her up so she can reach the handle) when going in the house. Unlocking the deadbolt (again, she has to be picked up) and opening to the doors to go outside. Pulling the blinds down at night. Closing doors at certain points of the day, such as right before naps and at bedtime. Turning on and off her humidifier. (sometimes) turning off the lights in the living room and dining room at the end of the day. Switching off the bathroom light after tooth brushing. (Tooth brushing happens in two phases - she does some and we do some). Walking under her own steam, most everywhere. She is working on buttoning and unbuttoning clothes and provisionally accepts help with that. Sometimes. 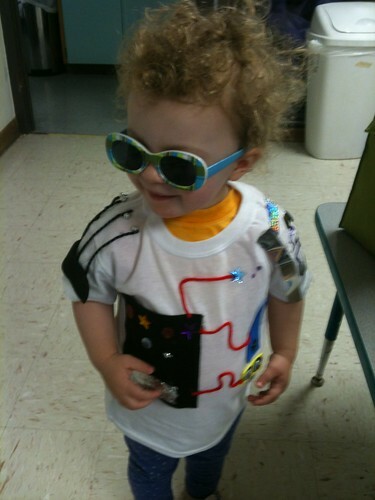 Similarly with zippers - if we start them for her she can zip them, and she's good at unzipping. She can put all her hats on herself, so of course she must. There's a lot of sitting on our hands going on while she struggles if any of these activities pose a challenge. It's gotten worse lately because she sometimes asks for help and then changes her mind and complains vociferously if we try to help. It's tough getting yelled at by your kiddo on a daily basis. And it especially hard to push her through on a schedule. And at least we have this one bit of leverage; if she's delaying doing something, we threaten to do something ourselves that we know she'd rather do, and then we start counting to three. "I need to do it," she says, and just after "two," she does. Almost every time. Grandpa Gay is visiting, and Rosie proudly told him "No diapers" yesterday when he asked if she's wearing them overnight. I got lots of great advice (mostly on facebook) in response to my post and am planning to get a waterproof mattress pad soon. So far she's only had a couple overnight accidents, but on the other hand if she gets up at 3 or 4 to use the toilet she has a hard time getting back to sleep. I was up with her this morning from about 3:30 to 6:30, at which point I completely zonked and Brian gave me another hour's sleep. She's getting better at getting to the potty or toilet in time to poop in it, but trying to be that sensitive is clearly also sending her to the potty at times when she doesn't have to go. We're trying to be positive, and also set a routine. It seems to be going really well.